Wow….what a lot of ‘work’ got done on Friday night!!!!! I haven’t been to visit everyone yet, but I’ve had a quick peek at what most of you got up to……wowza…..some nice progress made, that’s for sure! which just happens to be….. If you haven’t had the chance to pop on over to see what she got up to, I recommend it…..she’s showing off a gorgeous table runner and the link to the free pattern too! Congratulations Mel….you are the new owner of these gorgeous gifts…. just email me your details and I’ll pop them in the post for you! So looking forward to FNWF on the first Friday of the month (which is also the 1st of November) with Cheryll and then FNSI on the third Friday, which will be the 15th November, here with me again…..wow….isn’t this year flying past….it’ll be Christmas before we know it! Which reminds me….I’d better start soaking those raisins in rum, ready for the Christmas pud! Thanks again for hosting, congrats to Melanie. Congratulations Melanie K. Thank you for such a wonderful giveaway. 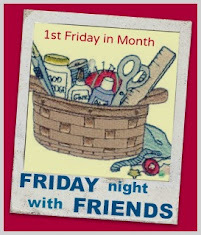 Had fun stitching along with all for FNSI. thanks Wendy and congrates to Melanie K for her win. enjoy. Thank you for hosting us all Wendy, it was fun to see what everyone has got up to. Congratulations to Melanie. Thanks for hosting FNSI Wendy, and congrats to Melanie!